After the conclusion of tne November treaties, the Bundesrat of the North German Federation, with the consent of the southern states, proposed in the Reichstag to give to the King of Prussia the title "German Kaiser." The initiative to this step was taken by the noble and unfortunate King Louis II of Bavaria. In a letter to King William of Prussia, of November 30, 1870, he wrote: "After the accession of South Germany to the constitutional union of Germany, the rights of the Praesidium conferred upon Your Majesty will extend over all the German states. 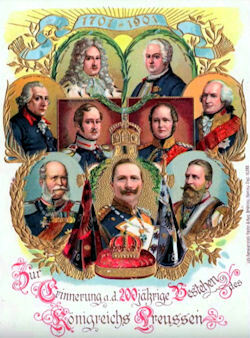 I have given my consent to their union in a single hand, convinced, that to do so corresponds with the interests of the German Fatherland as a whole and of its allied princes, but at the same time confident that the constitutional rights of the Praesidium of the Federation created by the restoration of a German Empire and of the dignity of a German Kaiser are rights which Your Majesty exercises in the name of the whole German Fatherland, upon the basis of universal consent of her princes. I have therefore proposed to the German princes to suggest with me to Your Majesty that the exercise of the rights of the Praesidium of the Federation should be connected with the title of 'German Kaiser.'" From this letter it can clearly be seen that the title did not carry any power, and that it was meant to be nothing but an honorary title, to express to the world externally the dignity of the new state. In this sense the title was accepted by King William of Prussia. Thus the new redaction of the Constitution, April 16, 1871, replaced the terms of the Constitution of the North German Federation with the name "Kaiser." The legal power of the Praesidium had not only not been increased, it had, in spite of the more dignified title, been decreased, owing to the accession of the southern states and the privileges granted to them. Only the King of Prussia, not a substitute or a regent, may bear the title Kaiser, although they were likewise endowed with all the Imperial power during the time they may happen to rule in Prussia. Since the Constitution said nothing in regard to the succession to the Praesidium, it was generally recognized that Prussian law alone determines it. The Kaiser did not participate directly in the creation of Imperial laws. As the instructor of Prussia's vote, the Kaiser had a veto on constitutional amendments and changes of Imperial legislation in regard to taxes and customs duties. The Kaiser had the right to convene, open and adjourn the Bundesrat and Reichstag. His consent was necessary for the dissolution of the Reichstag. A certain influence over legislation was exercised by the Kaiser through his right to appoint the members of the Bundesrat committees on the army, the navy and the fortresses. The Kaiser had executive functions of great importance. He was the international representative of the Empire. In the name of the Empire he enters into alliances and treaties with foreign countries, receives and accredits Ambassadors. By the right of appointing and dismissing the Chancellor and Imperial officials, inclusive of consuls, he controled the whole Imperial administration which expressly included the Post and Telegraph Service. The Kaiser carried out "federal execution" when ordered by the Bundesrat. He also had the power to declare martial law in any part of Germany if public security demands it. The law concerning the Constitution of Alsace-Lorraine made the Kaiser the governmental authority in that province. As such he appointed and removed the Governor and by doing this controled the votes of that province in the Bundesrat. Furthermore, he had an absolute veto on, the legislation of Alsace-Lorraine. A tremendous power was vested in the Kaiser as Commander in Chief of the army and navy, in peace as well as in war. The Kaiser was not responsible for his public or private acts. The Chancellor, by counter-signing his public acts assumes responsibility for them. This principle was generally accepted. What he cannot do as Kaiser, he may do as chief of the most powerful state in the Union. From the point of view of practical politics, it made no difference in which capacity he may at a given moment be acting. It could also easily be seen that if he did not exercise his power, the Chancellor, the only Minister of the Empire, who may combine with this position that of President of the Prussian Council of Ministers, would exercise it for him. Who was, at a given moment, the real ruler of Germany depends on the personality of Kaiser and Chancellor.